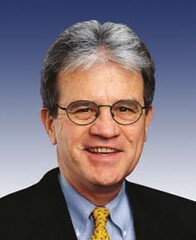 Will U.S. Sen. Tom Coburn go unchallenged by a viable Democratic candidate in his 2010 re-election bid? I discern two lines of thinking among local progressives over the issue. (1) Don’t run a candidate because it will be a waste of financial resources and energy. Unless the political landscape changes drastically, Coburn, pictured right, will easily win re-election. He’s the darling of the corporate media here and any challenger is sure to get little press coverage. The Oklahoman editorial page will also ridicule any Democratic candidate. Any viable candidate would have to run on a centrist to conservative platform, which could alienate progressives. The main race in 2010 for Democrats is the gubernatorial election. Democrats should spend money on and put energy into getting Attorney General Drew Edmondson or Lt. Gov. Jari Askins elected. One of these candidates will likely face Republican U.S. Rep. Mary Fallin, a formidable candidate. That should be the main political battlefield. (2) Run a candidate to develop political skills and networks. In particular, young Oklahoma Democrats, even if it’s inevitable Coburn will get re-elected, could benefit by working on a statewide campaign. (This could obviously backfire as well if the campaign turns sour.) Also, it’s somewhat of a morale crusher for Democrats that no viable candidate will step up and challenge Coburn, who is considered one of the most conservative members of the U.S. Senate. What does this say about Oklahoma Democrats to the rest of the country? Why not run a true progressive, who can at least offer a counterpoint to the tea party movement? This candidate may well lose, but at least there will be a rational voice out there in all the anti-Obama hysteria in the state. Gov. Brad Henry would be the best candidate to challenge Coburn, but he says he’s not interested in running. It’s also understandable that potential candidates would not want to expend the energy running a long-shot race, especially if the run had the potential to damage their political careers. Is the national Democratic Party even interested in helping with a campaign against Coburn? A viable statewide campaign will take money and a lot of energy. Thank you for taking the time to contact me regarding my relationship with Senator John Ensign, and my involvement with the proceedings surrounding his extramarital affair. I appreciate the opportunity to hear from you, and apologize for my delayed response. I understand your concerns, and the concerns of all of my constituents. I was heartbroken to learn that one of my dearest friends and colleagues, Senator John Ensign, had engaged in an extramarital affair. As a man of faith, I am deeply disturbed when any individual, elected official or lay person breaks a sacred trust between a spouse or significant other by engaging in and lying about an extramarital affair. I understand the grave concern of my constituents regarding any involvement I had with the circumstances surrounding Senator Ensign’s affair. I assure you that my involvement in the unfolding of the affair was solely in the best interest of protecting the families involved. Much of the media’s account of the episode has been inaccurate and based on a single source. For instance, at no point did I encourage Senator Ensign to hide or conceal his affair. In fact, my advice was the opposite. I have been reluctant to speak out and correct the record because the conversations that took place between me and Senator Ensign were intensely personal and private. Senator Ensign’s actions were wrong but it is important to remember the innocent family members and individuals involved, all of whom need to heal in private. As my constituent, you are rightfully permitted to hold me and my actions accountable regardless of the circumstance, and I encourage you to continue to do so. Again, thank you for taking the time to contact me. I look forward to hearing from you in the future. God bless. In other words: “Dear constituent, thanks so much for pointing out what a hypocritical liar I am. Now go flork yourself.